Recent photos show the construction progress and how far the project has come since the beginning of 2018, when it began to rise above the original building. 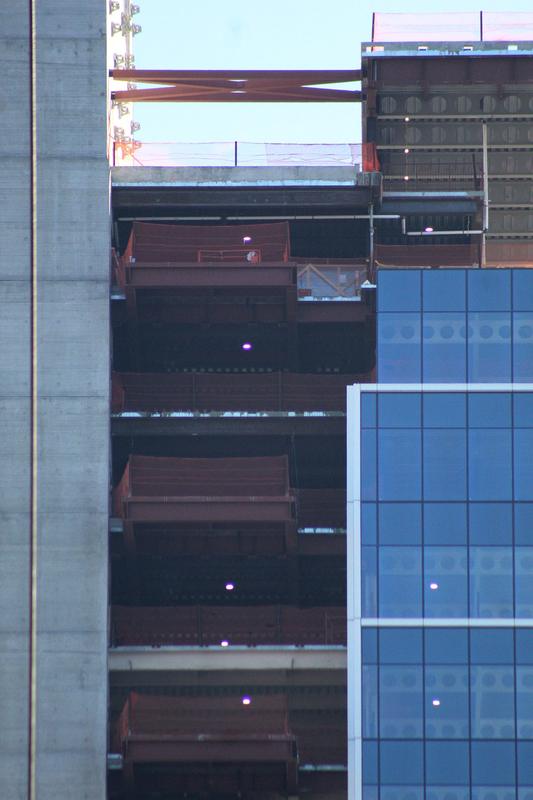 The nine-story podium will maintain its dark-colored masonry facade with ribbon windows, although the inside will be converted into future office space. Landscaped terraces will accompany the structure on multiple levels, while large floor-to-ceiling glass windows cover the eastern, southern and western exteriors of the new addition. The new core will be positioned on the northern elevation. 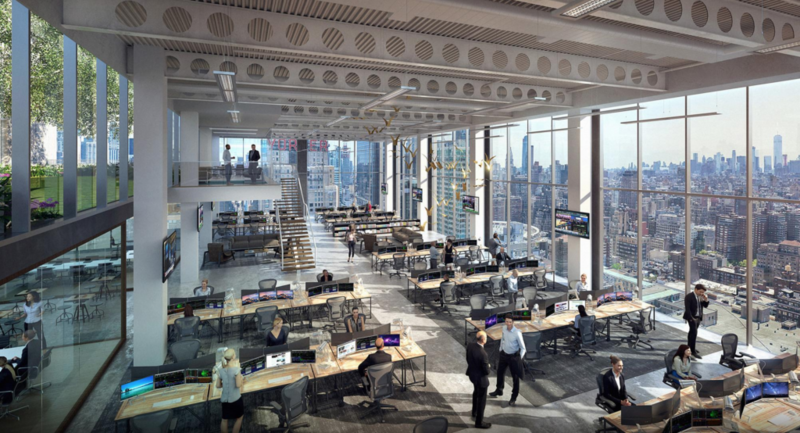 There are multiple setbacks in the new 17-story addition where workers can step outside to enjoy fresh air, sunlight, and views of Manhattan West and Hudson Yards from a comfortable distance. A number of floors inside will have double-height spaces, making the interior environment more open and visually lighter by allowing extra daylight to enter. 441 Ninth Avenue is expected to be completed before the end of 2019. 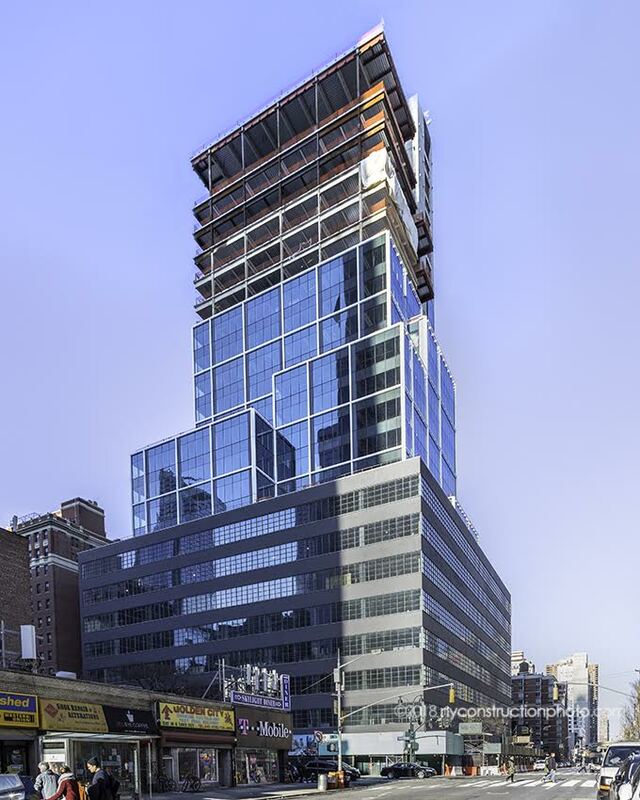 10 Comments on "Kohn Pedersen Fox’s 17-Story Addition at 441 Ninth Avenue Progresses Above Midtown"
I really love this project, and have watched up go up since it’s on my walk to work. Reusing the older building in the new project is fantastic, and those proposed offices in the renderings look quite lovely. Yes, same happening in 425 Park and in 390 Madison, the latter of two projects didn’t received not a single word from YIMBY. Why??? 390 Madison btw it’s bigger than 425 Park, 900,000 square feet versus 700,000 square feet. 390 Madison is rebuilding older 24 story into 32 story. Just few street blocks north from One Vanderbilt, not a single news from YIMBY at all!!! Also no news about other big projects, such as Neptune Sixth, biggest construction site in South Brooklyn, near Coney Island. No stories were about 28 story residential building in Sheepshead Bay, sure YIMBY journalism didn’t traveled to Coney Island on Q/B line and didn’t see tallest structure built in there, 331 feet tall. Hardly missed. Tallest in Sheepshead Bay and not a single story about it from YIMBY. Building was constructed 2016-2017, it was opened early 2018, and no words from YIMBY. Btw, the YIMBY is a major one site source for new construction in NYC for general public, and missing stories of new construction or rebuilding a major projects, make YIMBY not a complete source of that information, and funny that YIMBY stories covered many minor projects, including 2-3 story 2-3 family houses, single story construction of warehouses, but failed to cover all major highrises, some of them is not so bad, at least not a worse than 441 Ninth Ave. Like 390 Madison 900,000 square feet office project, like huge Neptune Sixth Complex, and Sheepshead Bay Tower!!!! Hello, YIMBY????? And thank you, Building at 390 Madison is almost fully leased, Chase rented 440,000 square feet there while his 270 Park avenue goes down to be replaced with 1400′ up to 1550′ tall building. Several law firms, and 390 architecture and design is interesting, because they demolish only 18% of existing building, older 24 story glass structure raising up several floor plates and making it up to 32 storied mini-skysraper. Same design company, KPF. I didn’t mention 425 Park, you covered it a lot, what’s surprising me even more not hearing any stories about 390 Madison, located just in a middle distance between One Vanderbilt and 425 Park Avenue. And yes, your stories are interesting to read, and pictures are very informative, and you trying to cover absolutely everything, from new supertall and mega centers like HY to single Two three family houses, and small neighborhood retail or restaurant. It’s better than Curbed NY, 6sqft, TheRealDeal, FieldEdition, and you start publish your stories in daily base including weekends and even on holidays like from last year December. Thank you YIMBY for that. Maybe it’s a fault for unprecendent scale of new construction binge in NYC not seeing from at least from 1980s!!! Interesting high rise project, turning dull 8 story grey brick masonry structure into ultra modernist 25 story, in area where this 8 story was one of tallest building just half decade ago, in 2014-15. 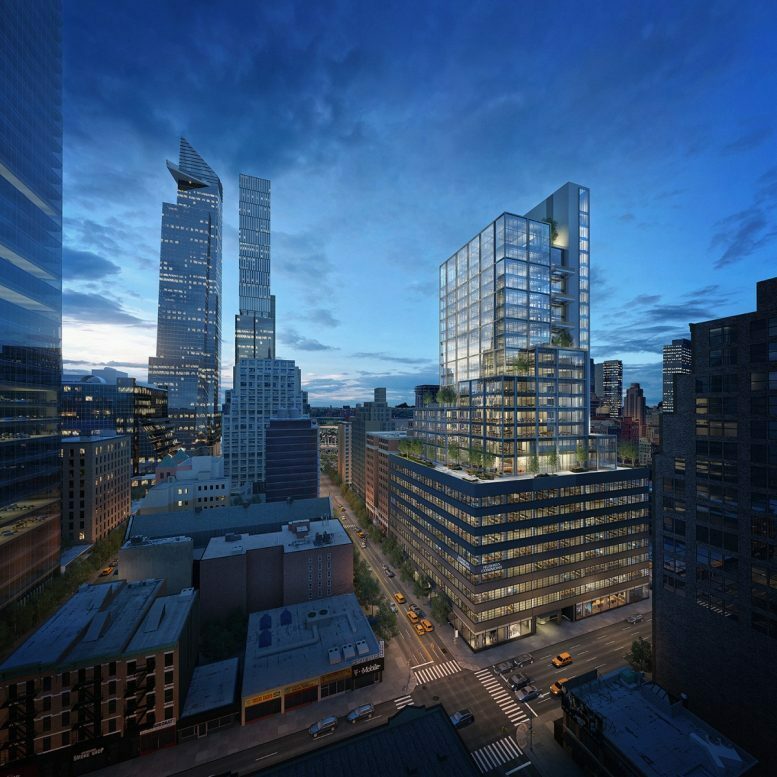 Just a small street block north of supertall mammoth, One Manhattan West, or 401 Ninth Ave, and one big avenue block to Tenth Avenue, where New Hudson Yards Neighborhood lies down, also, two blocks from Penn Station 8th Avenue Entrances. The location of this newest Office building as well as Manhattan West complex is cannot be better, a block to 8th Avenue Subway lines, LIRR, NJ Transit, Intercity Amtrak trains and Megabus, Bolt Bus. It’s Midtown Manhattan a new edge addition, including Hudson Yards nearby. Located just steps from One Vanderbilt, and you cover that supertall construction there and no news from you about major highrise construction on THE SAME AVENUE, just a few blocks north. This is a (New) New York Newest Reality, if not a One Vanderbilt Mammoth that new construction conversion will be major news in that portion of Midtown Manhattan and project in scale of 441 Ninth Avenue, or even bigger, similar to 425 Park. Using older midcentury modern office lower rise as a new podium for new multistory additions with partially demolish, then replace or completely rebuilt what was existing before that. Btw that 390 Madison Avenue new 900,000 sq feet construction above is major of such after 425 Park Avenue, located just few blocks north west. And not any news about Skyscraper Project in Neptune Sixth??? A biggest construction in whole South Brooklyn, steps from Coney Island Luna Park and Wonder Wheel, in heart of Russian/Jewish American Neighborhood, not a single coverage since this project (Neptune Sixth) became reality, and scale of this Project, and controversity of local people who are not so welcome this. A New Shopping Center, 225,000 square feet, 6th Story 165,000 square feet office retail and 470 feet tall (430′ excluding a roof mechanicals) 42 story controversial residential skyscraper (in Brooklyn term), indeed just 22 feet less height to become official skyscraper definition worldwide. Office building of Neptune Sixth was already finished last year, it’s a major new Office Construction in this area of Brooklyn for decades, and they now building a big shopping center, a part of this project, and then will be start 42 story residential construction. NIMBY here is lost, but no YIMBY stories!!! You cover everything, Jamaica, South Bronx new construction, and missed a major construction site outside of Downtown Brooklyn, Brooklyn Heights, Williamsburg, Greenpoint and Bushweek. Interesting things, you covered a new 22 story highrise construction near Sea Gate, a major Coney Island Hotel and Theater conversion recently, and no news about “Neptune Sixth”, and no News about “390 Madison Avenue”, located just off One Vanderbilt Supertall!!!!!!!!!!!!!! Hello, YIMBY!!! This for you, “390 Madison Avenue”, Google it, same architectural firm, KPF, 411 feet tall a new 32 story conversion of older 24 story, full new glass renovation and redesign, floor plate redesign, very nice and pretty tall project of moderate height. Worth to be covered in your stories, but you missed it, opened in 2018, so whole construction is already concluded and finished. Beside 425 Park and One Vanderbilt this was a major office construction in the area in 2016-2017. KPF is generally created nice office projects across the whole City. 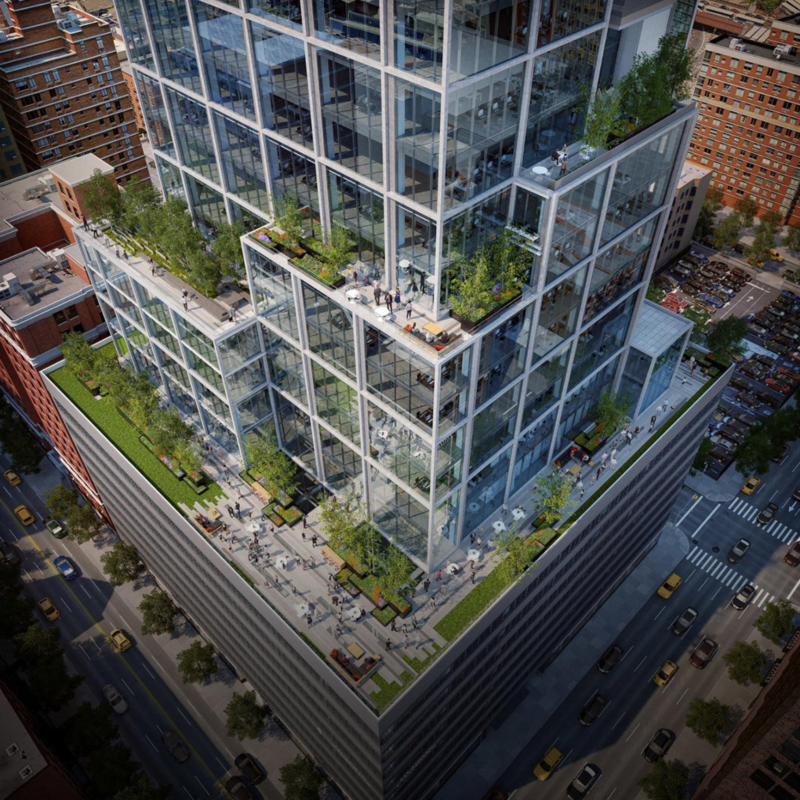 441 Ninth is just added new stacked reflecting glassy cubes, 2 floor each one, on the top, and yes for sure it’s mimicking a future Spiral at 66 Hudson Yard Blvd, except it is in much smaller scale, but indeed 390 Madison Avenue building is completely more complex, it’s practically raised up their floor plates, creating not just an addups on it’s roof but completely new building, like nearby 425 Park Avenue!!! Sorry, but 441 Ninth Avenue is just became ordinary “newish” high rise, and it’s too many similar of them across our Great City. Pardon me for using your space: Chill the F out Jack! Personally, I come here to read about the smaller projects since I can relate to them and they’re actually interesting…I don’t really care about multi billion dollar buildings I’ll never step foot in. Keep doing what you’re doing YIMBY! 441 Ninth is not a cheap project, it’s probably the same as Neptune Sixth and 390 Madison. And YIMBY covered Central Park Tower and Hudson Yards Mall restaurants, what’s can be out of reach of yours. Small projects, YIMBY covered mostly everything, like 90% of total construction projects, and 390 Madison last coverage from YIMBY was one and half year ago, in 2017, when this project was top out. Yes in my backyard, or YIMBY, and I’m definitely sure NIYMBY, or not in my back yard people were against this 390 Madison, as well as they definitely were against this 441 Ninth and nearby 67 story 995 feet tall One Madison, like it’s too tall, makes neighborhood unaffordable, another glassy box, same people who almost ruined down (hopefully it’s not) Amazon HQ2 in LIC, and what Bezoz will find them HQ2 Headquarter in Nashville instead. Mean Nashville wins, when New York loose!!! This is a Formula, and don’t be surprise when China will built 5 times scale HY projects in one city in three years. When America loosing, a China definitely a winner!!! Maybe only AOC doesn’t understand this!!! Too, sad that accordingly New Green Disaster by AOC we have to make all buildings in USA using 100% renewable energy source. And no gas powered cars, buses, airplanes, aircraft carriers, submarines, no nuclear power stations, open borders and plenty light rails and high speed trains instead of air travel, and whooping 200 trillion national debt and dollar cost 1/1000 of current exchange rates! So they want to destroy Hudson Yards because it’s too capitalistic….